If you have any interest in where CRM systems are headed down the road, I highly encourage you to read the Forbes article “Roundup of CRM Forecasts and Market Estimates, 2012” by Louis Columbus. In this article, Mr. Columbus talks about how quickly behavioral and predictive analytics, greater usability, integration with social media and mobility are transforming the CRM market. In fact, he predicts that the future CRM system may have a hint of a Facebook-ish look and feel. 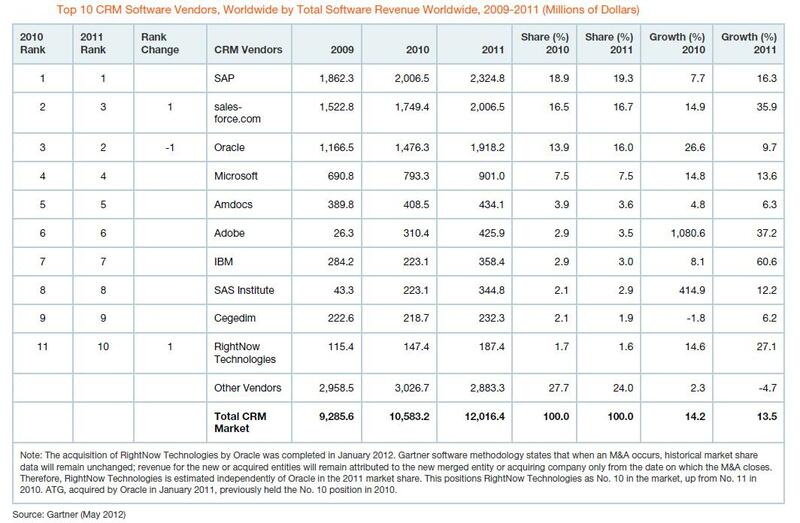 Which CRM provider does Gartner predict to take over SAP as the leader in market share in 2013? Who will be responsible (Chief Marketing Officer or Chief Information Officer) for defining the needs of an enterprise in the areas of CRM, pricing and channel management strategies? Gartner is forecasting that ___% of all CRM applications will be Web-based by 2016? ___% of sales organizations will issue iPads and tablets as the primary device standard issue for salespeople by 2014? Axonom delivers many cloud-based applications like (Time and Billing, Product Configurator, Portal access, and Scripted Surveys) via the tablet. Gartner predicts that by 2014, public social media networks will be in use by ___% of sales professionals with only ___% adoption rate of social CRM applications in the same time period? Will there be a CRM vendor in the near future that can combine analytics, mobility, cloud, and great usability?